Let us suppose that Outlook sends an email to recipient on an Exchange 2007 server, however, that server calculates that it cannot deliver the message – what happens next? The answer is the ‘Generating Server’ sends a NDR (Non-delivery Report) back to the sender’s Outlook. At first, it comes as a revelation when you discover that there is more than one type of Exchange 2007 NDR. Then you discover that NDRs have enhanced status codes. Furthermore, each code number gives you extra information about the cause of the email delivery problem. This page will help you troubleshoot these NDR codes. When you examine the diagnostic information in a NDR message, make a note of the three-digit code, for example, 5.3.1. In Exchange 2007, these are know as ‘Common Enhanced Status Codes’. If the first number begins with 5, then it means you are dealing with a permanent error; this message will never be delivered. Occasionally, you get an Exchange NDR beginning with 4, in which case there is hope that email will eventually get through. The place to look for this NDR status code is on the last line of the report. NDR codes such as 5.5.0, or 4.3.1, may remind you of SMTP errors 550 and 431. Indeed, the 500 series in SMTP has a similar meaning to the 5.y.z codes in an NDR – failure. Perhaps you have worked out why there are no 2.y.z Exchange NDRs? The reason being the 2.y.z series mean success, whereas Non-delivery Reports, by definition, are all failures. Clearly these status codes are not random numbers, thus we can detect patterns. The first number 4.y.z, or 5.y.z refers to the class of code, for example, 5.y.z is permanent error. Incidentally, I have not seen any status codes beginning with 1.y.z, 3.y.z, or have I seen any numbers greater than 5.7.z. The second number x.1.z means subject. This second digit, 1 in the previous example, gives generic information, whereas the third digit (z) gives detail. Unfortunately, I have not cracked the complete code for the second digit. However, I have discovered a few useful patterns, for instance, 5.1.x indicates a problem with the email address, as apposed to server or connector problem. In addition, 5.2.x means that the email is too big, therefore I recommend checking the message limit setting on the Exchange 2007 server. Conclusion, research the three-digit error in your enhanced status code, see Exchange NDR codes below. Here below is an example of an email sent to a non-existent user. There is no jethro mailbox on the worcester server. In the body of the NDR, you can see the name of the domain (exchJethro.com), the server (worcester) and the NDR status code (5.1.1). In your examples, always seek out the servername in the Received: from server (IP Address) of your NDR. It could also be that the delivery directory on the Virtual server has exceeded its limit. 4.3.1 Insufficient system resources. This normally means not enough disk space on the delivery server. Microsoft say this Exchange NDR maybe reported as out-of-memory error. 4.3.2 A classic temporary problem. Most likely, the Administrator has frozen the queue. 4.4.1 Intermittent network connection. The server has not yet responded. Classic time-out problem. If it persists, you will also get a 5.4.x status code error. 4.4.2 The server started to deliver the message but then the connection was dropped. The sending server is configured to retry automatically. 4.4.7 Problem with a protocol timeout, for example a message header limit. Check receiving server connectors. 5.0.0 SMTP 500 reply code means an unrecognised address. You get this NDR when you make a typing mistake when you manually try to send email via telnet. The most likely cause is a routing error. One solution maybe to add an * in the address space. 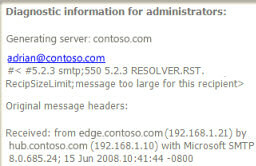 5.1.x Exchange 2007 NDR problems with email address. 5.1.0 Sender denied. Often seen with contacts. Verify the recipient address. Mismatched Network Card duplex setting. 5.1.1 Bad destination mailbox address. 5.1.1 is the most common Exchange 2007 NDR; there is a problem with the recipient address. Maybe the recipient does not exist. 5.1.2 SMTP; 550 Host unknown. An error is triggered when the host name can’t be found. For example, when trying to send an email to bob@ nonexistantdomain.com. 5.1.3 Invalid recipient address. Another problem often seen with contacts. Address field maybe empty. Check the address information. Or there could be a syntax error. 5.1.4 Destination mailbox address ambiguous. Two objects have the same address, which confuses the Exchange 2007 Categorizer. 5.2.x NDR caused by the large size of the email. 5.2.2 Sadly, the recipient has exceeded their mailbox storage quota. 5.3.4 Message too big. Check the limits on both the sender and receiver side. There maybe a policy in operation. 5.5.4 Invalid domain name. The true cause maybe an invalid character. 5.7.1 A very common Exchange 2007 NDR, the cause is a permissions problem. For some reason the sender is not allowed to email this account. Try disabling Windows-Integrated-Security. Instead allow only standard authorization on the SMTP receiver on the Exchange 2007 server. Emails are delayed, or are not received. Users receive NDRs which are difficult to interpret. Messages are accumulating in one of the queues on the Exchange 2007 server. 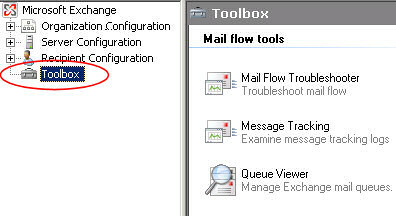 Mail Flow Troubleshooter will diagnoses the retrieved data, and even make suggestions for cures to your NDR problems. You enter the symptoms from a pick list, the Mail Flow Troubleshooter then employs built-in logic to suggestion solutions. It may be a help, or the ExBPA may distract you from troubleshooting NDRs. What the ExBPA will do is provide a general health check for the Exchange 2007 server. Good technique is to begin by looking in the Application log for errors. A variation of this tip is to increase the Diagnostic Logging. Check the queue and SMTP logs on the Exchange 2007 server. You may try turning off temporarily anti-virus software and even the client-side firewall to see if that enables the email to get through. Note: Each cmdlet has switches or parameters, try: get-Help verb-noun to find out more about an interesting cmdlet. Success means that the SMTP mail server is available. See here for help with Telnet troubleshooting. Send another email to the same recipient but using a different sender. If it’s attachment, then try with no attachment. If it’s just one email address that produces the Non-delivery report, what happens if you type the SMTP address manually, compared with when you click the user account in the GAL? Alternatively, you could send emails to different recipients from the original sender. Is the the Exchange NDR random, or can you reproduce it easily? Do you have multiple sites? If so are they all affected, or just one? If all else fails try sending an email to oneself! Bear in mind that Microsoft Outlook has a ‘Test Account Settings’ button to collect information from the client side. Check the logs (mentioned in the tools section). My favoured non-delivery troubleshooting technique is to narrow the search area to a particular server, mailstore or Routing Group Connector? However, if that fails then I would expand the search area by sending email to different sites, or to internet users. I was initially annoyed because one particular ISP would only troubleshoot NDRs if I used the Outlook Express client. At first I was annoyed, but then I realized that you get different responses from different email clients. 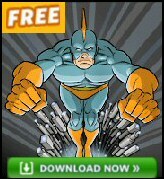 Therefore my tip is, try a different version of Microsoft Outlook. It is possible to disable NDR in Exchange. However, there is more then one place to visit if you want to turn off NDRs in Exchange 2007 server. Log on as administrator, and navigate to the Exchange Management Console. It makes most sense to start with the Hub Transport node, remember this role is needed if you send emails to recipients on the same server. Note: You can also control ‘Allow delivery reports’ on this tab. These are the normal DSN delivery status notifications. If you are experimenting with allowing, or disabling NDRs, then this PowerShell cmdlet will be quicker. Note 1: "Default" is the name of the Remote Domain setting where you want to turn off NDR. set-RemoteDomain "Default" -NdrEnabled $true. This places a tick in the checkbox. If you clear this option, NDRs aren’t sent to any email address in the remote domain. Note 3: For more information about this, or any other PowerShell cmdlet, precede the command with get-Help. For example: get-Help set-RemoteDomain. This ability to control NDRs is particularly useful on servers with the Unified Messaging Role. Click the Unified Messaging folder. On the UM Dial Plans tab, select the UM dial plan that you want to manage, and then select Properties. 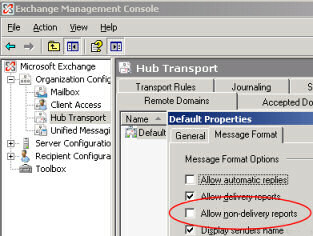 From the General tab, check or clear the box next to ‘Send a non-delivery report if message delivery fails’. There several reasons to turn off NDR in Exchange 2007; for example, virus infections, spam infiltration or spoof attacks. Note: there is no Badmail folder option in Exchange 2007, not even a registry hack. Instead badmail remains in the pickup folder, you will spit the badmail by the .bad file extension. There are many reasons for an NDR in Exchange 2007. If you examine an NDR carefully you will find ‘Diagnostic Information for Administrators’. Within this message box is a status code number, for example 5.1.1. Two points arise from this preliminary troubleshooting, firstly, there is more than one error code, and secondly, a wide variety of possible causes. My aim is drill down into the enhanced status code and discover the reason why Exchange 2007 sends a particular NDR.